As we finish celebrating Black History Month, and the 50th anniversary of the Fair Housing Act, the Senate is set to consider legislation that would undermine our nation’s commitment to ensuring equal protection under the law. At a time when harmful rhetoric and policies from the Trump Administration are sowing divisions that attempt to marginalize racial, ethnic and other minorities, Congress should not weaken civil rights law or consumer protections by exempting more than four in five banks and credit unions from a requirement to disclose information about mortgage loans. If it does, anyone who may want to buy — or sell — a home will be impacted by reducing transparency for mortgage loans made by banks and credit unions which make fewer than 500 loans a year. Between 2020 and 2030, 88 percent of new household growth will be nonwhite. In the years to come, new homeowners will be disproportionately Latino, African American and Asian Pacific American. Yet, a recent study from the Center for Investigative Reporting found that African American and Latinos are routinely denied mortgages at rates far higher than whites. A recent study from the Center for Investigative Reporting found that African American and Latinos are routinely denied mortgages at rates far higher than whites. Racial disparities in mortgage access are harming families just as they are beginning to recover from the financial crisis of 2008, which was caused, in large part, by predatory subprime loans. 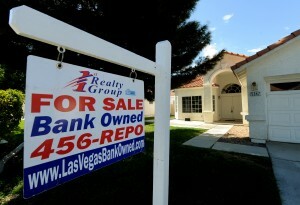 Tragically, Nevada had the highest foreclosure rate in the nation for 62 straight months during the Great Recession. Things got so bad that in 2010, one estimate found that 70 percent of homes in Las Vegas were “underwater” — meaning the borrower owed more on their mortgage than the house was worth. Many of these borrowers had equity in their home before they were targeted by an unscrupulous lender that aimed to strip that equity by refinancing borrowers into loans with high fees and unsustainable monthly payments. The result was the destruction of trillions of dollars in household wealth, and a hollowing out of many of the neighborhoods that had been targeted. Anyone driving through parts of Las Vegas in 2009 could see the boarded up houses, the “for sale” signs, and the unkempt lots that had been abandoned by absentee banks. And while all neighborhoods suffered, we saw that African American, Latino and Asian communities in Nevada and across the country experienced higher foreclosure rates, even after accounting for their income and wealth. African American and Latino families were more than twice as likely to be denied a loan. When they did get a loan, they were more than twice as likely to have a subprime loan than a white family, even when they had the same or better income and credit scores. In the aftermath of this devastation, policymakers realized they had incomplete data to understand patterns in discriminatory lending, and how it impacted various communities. Without adequate information, state, local and federal governments were unable to identify the prevalence of predatory or discriminatory lending to prevent foreclosures and financial crises. As a result, the Dodd-Frank Wall Street Reform and Consumer Protection Act of 2010 modestly expanded upon information reporting that had started in 1975 under the Home Mortgage Disclosure Act, a key civil rights and consumer protection law aimed at fighting racially discriminatory “redlining” mortgage practices. This expansion required banks and credit unions to report information they are already collecting in the underwriting process — including specific details on the loan such as the total points and fees, the difference between the annual percentage rate paid compared to the benchmark rate for all loans, any prepayment penalty terms, the value of the property, the borrower’s credit score, and whether the loan was a “reverse mortgage” sold to a senior. Lawmakers sought to expand reporting requirements to help policymakers to better identify when underserved communities are being unfairly denied loans or overcharged. It also allows law enforcement to efficiently use their resources and target the predatory lenders that unfairly drag down the good actors in the banking industry. Current legislation pending before the Senate — the Economic Growth, Regulatory Relief and Consumer Protection Act (S.2155) — would exempt around 85 percent of banks and credit unions from the new reporting requirements. Its supporters claim they are just trying to reduce regulatory requirements on small banks and credit unions, even though current law exempts truly small lenders, those making fewer than 25 mortgages in each of the past two years, as well as financial institutions not located in metropolitan areas. Banks and credit unions, including small institutions, are making record profits. Now is not the time for Congress to make it harder for state attorneys general to fill the void in consumer protection and civil rights enforcement that President Trump is creating. Yet without this data, state attorneys general, fair housing advocates, and others would be back to where we stood in the aftermath of the 2008 crash: we could not connect racial, ethnic, gender and age discrimination to mortgages made in our communities and across the country. At the same time, President Trump installed his own budget director and cabinet member, Mick Mulvaney, to also direct the Consumer Financial Protection Bureau. Mulvaney has wasted no time in undermining the Bureau’s mission of equal protection under the law. He stripped the CFPB’s fair lending office of its enforcement and supervision authorities, has vowed to roll back rules meant to stop the payday lending debt trap, and has ended lawsuits against predatory lenders charging 900 percent interest rates. As former officials charged with enforcing consumer protection and civil rights laws, we know firsthand that his approach to law enforcement is deeply troubling, and that state attorneys general across the country will struggle to protect homebuyers and consumers that Mr. Mulvaney is creating for cheaters across the banking system. Now is not the time for Congress to make it harder for state attorneys general to fill the void in consumer protection and civil rights enforcement that President Trump is creating. If S. 2155 is enacted, regulators, law enforcement, and advocacy groups across the country will lose critical information they need to stop discrimination — before it turns into another crisis that devastates Nevada, our communities and the national economy. Catherine Cortez Masto is a Democratic U.S. senator from Nevada. Vanita Gupta is the president and CEO of the Leadership Conference on Civil and Human Rights.